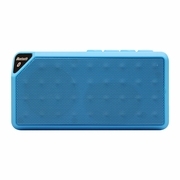 Power your music with this handy wireless Bluetooth® speaker! Get quality sound from this small yet powerful amplifier, sent from a Bluetooth-enabled device or via the 3.5 mm audio input. Compatible with just about anything that plays audio, it is perfect for travel and on-the-go, or simply use it on your desk. Made from durable ABS plastic, this pocket sized speaker has a range of 33 feet and easy-to use power and function buttons.